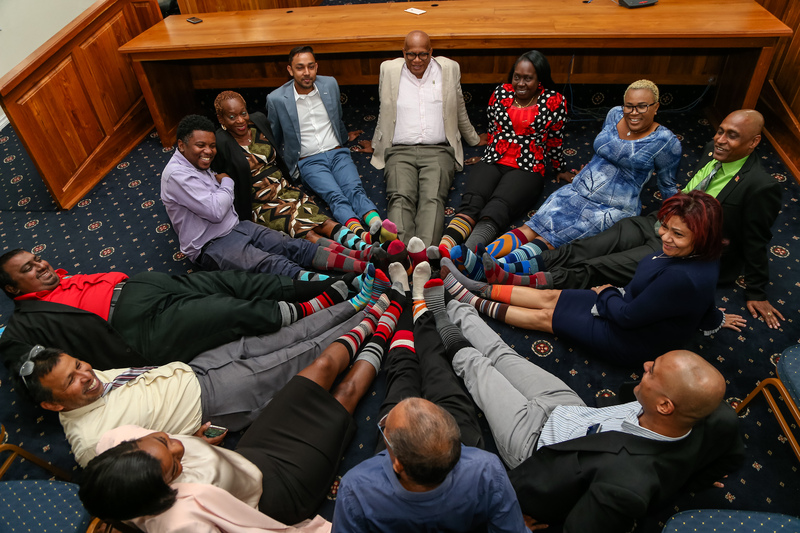 San Fernando mayor Junia Regrello, deputy mayor Vydia Mungal-Bisessar along with aldermen and Councillors of the San Fernando City Corportation show off their colored socks to raise Down Syndrome awareness at the mayor's office in San Fernando. Employment is more than merely a source of income. It gives persons a sense of purpose, it fulfils the need for an individual to be productive, it promotes independence, and enhances self-esteem. However, most importantly, in relation to persons with Down syndrome, it will allow for participation in the mainstream of life so that they are no longer forced to remain in protected or sheltered environments where their potential runs the risk of being stifled. I have previously discussed the lack of inclusion in the mainstream education system. This lack of access to education and training in skills relevant to the labour market is a major barrier to the job market for persons with Down syndrome. This, coupled with the fact that such persons are often subjected to negative attitudes or opinions and deeply rooted stigma or stereotypes, not only prevents them from reaching their full potential and being active, productive citizens in the employment sphere, but is an infringement of their basic human rights. This is because the right to work and the right of inclusive employment are not merely inconsequential expressions but are legal rights outlined by multiple international human rights instruments which Trinidad and Tobago has ratified. For example, in Article 23.1 of the Universal Declaration of Human Rights it states that everyone has the right to work, to free choice of employment, to just and favourable conditions of work and to protection against unemployment. More specifically, Article 27 of the United Nations Convention on the Rights of Persons with Disabilities obliges states parties to recognise the right of persons with disabilities to work, on an equal basis with others. Therefore, there is coherent and complete protection of persons with disabilities in the employment sphere. Still, the reality today is that many persons with disabilities, including intellectual disabilities such as persons with Down syndrome are not being accommodated in the work place. The Down Syndrome Family Network, the leading advocacy NGO for persons with Down syndrome in TT, has sought to bridge this gap by liaising with certain companies and government agencies to offer self-advocates internships and work experience. Tyrese Niles, Christy De Souza, Surya Hosein and Kelly Simmons have all managed to land themselves internships and even full-time employment at places such as Aeropost, Digicel Imax, and the Ministry of Gender and Youth Affairs. While this is commendable, it is high time that instances of hiring persons with Down syndrome become the norm rather than the exception. With this being said, it is also important to acknowledge that it is no easy task and there will be challenges to overcome in order to effectively include persons with Down syndrome and other disabilities on staff. For example, preparing employees to receive them, train them, and creating opportunities for growth are a few. Yet, those who chose to take up the challenge of hiring people with intellectual disabilities will find that these persons can add value to organisational health. They can have a significant positive impact on leadership, client satisfaction, and the culture and climate of the work space. To conclude, the barriers to having an inclusive employment environment are many. There are educational barriers, attitudinal barriers, weak national legislation or policy frameworks, and lack of institutional support from the government. However, this does not mean that it is not a goal worth pursuing. Persons with Down syndrome have the same human aspirations as those around them and deserve to have the avenues to achieve them. Also, an inclusive school and work environment is conducive to an inclusive society. An inclusive society is one in which stigma and stereotypes are broken down, and persons, despite their disabilities, are not limited because of them. Reply to "Down syndrome and employment"